Need more information about booking Home 337148 ? The apartment is spacious and light, comprising bedroom with ensuite shower/wc and kitchen/diner opening onto the balcony overlooking the mountains. We aim to create a peaceful and calm environment for our guests, away from the busy distractions of everyday life. The decor is simple and stylish and includes everything you need to enjoy your stay. Wooden floors, natural fabrics and feature stone walls. There is a well equipped kitchenette which has everything you require for simple cooking at home. All towels, including beach towels and a few kitchen basics are included to get you started. The balcony is a great place to enjoy breakfast and in the evenings, watch the stunning sunsets. Situated in a sympathetically renovated stone village property, the apartment is located on a quiet road on the outskirts of the village with superb unrestricted views across the fields to the mountains. Free wifi is available and for everyone wanting to keep abreast of their local news or TV, we suggest bringing a laptop or tablet and using one of the many free online platforms. Parking is available opposite the apartment. The road is very quiet with very few cars and the occasional tractor passing by. The outskirts of Lemesos (Limassol) are a short 10 minute drive away on the motorway or 15 minutes along the coast road passing the ancient Amathus ruins. Just opposite the main entrance to the village is the access road to the motorway that connects Pentakomo to Paphos, Nicosia and Ayia Napa. Pentakomo is ideally located for visiting the many local historic attractions, including the Monastery at Agios Giorgos (5 mins), the Kalavassos Tenta (5 mins), UNESCO World Heritage site of Choirokoitia (10 mins) and the ancient ruins of Amathus (10 mins). We will be here to greet you on arrival with the keys and also advice on the village and local area. Pentakomo villagers are extremely friendly and quick to chat or offer advice if asked. When in Cyprus we stay in the ground floor apartment with our cat Princess Margaret ! We enjoy meeting new people and are always happy to answer questions and give suggestions on places to visit. However we are also very respectful of people's privacy and space. Everyone tends to find the right balance of interaction that works best for them . The building has three apartments, including ours, all with their own exterior space and dedicated seating area. We aim to provide a calm and peaceful environment for our guests and the apartment is rented on the basis of 2 adults sharing. If anyone would like to smoke, we ask that they do this outside - no real hardship most of the year ! A small daily fee of €3 is charged to cover extra electricity usage for those guests who would like air conditioning. We have not added it to the room rate as we think the decision to make use of it is best made on arrival. We have just returned once again from our stay at Pentokomo. The village never fails to hit the spot for traditional Cypriot hospitality. Julie is a more than capable hostess whilst Hubby Phil is around from time to time to help if needed. The balcony apartment suits our need to a tee. Even February offered a chance to sit outside and take in the glorious surroundings. Whilst potentially sharing the balcony, as your neighbour accesses their apartment for a very short time this helps to get to know and have a chat with like minded people who are there to share the same experiences as yourself. The apartment is more than adequately equipped, with washing machine available as and when required downstairs. Once more we were very sad to leave and hope that someone gets to enjoy what we have had to leave behind. Owner's reply: Thank you! As always, it was a real pleasure for us to welcome you both back to Pentakomo. Hopefully it won’t be too long before you return. A compact, clean, quiet and adequately equipped apartment in a good position near the heart of Pentakomo. There is a steep flight of about twenty stone steps to reach the front door and it would be a challenge for anyone with mobility problems. The terrace balcony is a pleasant place to sit looking out towards the Troodos mountains with a coffee or something stronger! There is a two ring hob, useful for a fry-up or pasta and a sauce but no microwave or oven. If, like us, you just want to make coffee, a simple breakfast and eat a salad for lunch you will find everything you need. The shower is reliable and Julie provides all you need in the way of mosquito protection. The bed was long enough for my six foot husband even though it has a foot board. The absolute strength of this apartment is the warm welcome you will receive from Julie and Phil. A car is a must, no buses nearer than a kilometre. The village restaurant, run by Dimitri, has no menu but cooks local food at its freshest in a wholesome country style. Julie and Phil are excellent hosts, always there when you need them and unobtrusive at other times. Very nice apartment with lovely views. Set in a quiet part of the village with shops and tavern a few minutes walk away. Limassol is just 10 minutes by car and has every thing you could need. Lovely well made paths at the edge of the sea to walk on. We thoroughly enjoyed our stay and will return again. We stayed here for a week over Christmas. For us two it was ideal. It is designed for couples without children. The owner provided us with comprehensive instructions of how to find her place by e-mail before we left the UK. So no worries there. The owner, Julie met us and showed us upstairs to the apartment. If you have mobility issues I suggest you think carefully about booking this charming apartment. It is accessed via two flights of fairly steep stone stairs. 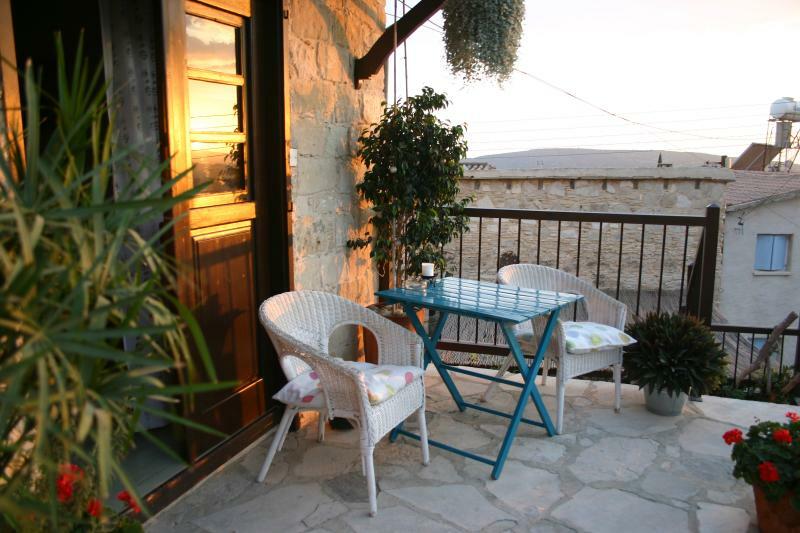 The apartment balcony overlooks open countryside with far reaching views up to the mountains. The place was spotless and fitted out with all you need for a relaxing and quiet holiday. The kitchen has the essentials needed to cook a good meal using the two ring hob. A fridge, pots and pans, crockery and cutlery make up the kitchen armoury. The apartment has a nice comfortable cane sofa and chairs to laze about on. The bedroom has a comfortable bed and good views from the window. Spare blankets were provided and used. A small TV is provided if you miss the ‘Haunted Fishtank’. Access to Broadband is provided so you can book your seat for the flight home or plan your day after checking on the weather. Pentakamo is a small traditional village with narrow streets but has the essentials for a good holiday, a small supermarket, butchers and 2 tavernas. It is close to archaeological sites, traditional villages and a Blur flag beach. The main road and motorway are only 5 or 6 minutes away, so Larnaca airport is a brief 35 minute drive. A car is essential. I can thoroughly recommend this place for a quite (apart from the church bells) time away. We stayed here for a short break in early May. The apartment is situated in a charming village with far reaching views across countryside and up into the mountains. It's village location gives you a holiday that makes you feel part of a community, rather than a bland hotel in a tourist district. Our trip coincided with Easter so it was lovely to see the village alive with activity and to listen to the morning church bells. The apartment is clean, surprisingly spacious and simply furnished and a perfect base for day trips, either to the beach or into the wider countryside. This is a wonderful apartment, and was just right for the two of us when we wanted a relaxing break. In the apartment, everything needed is to hand and there are wonderful sunset views from the balcony. Julie and Paul, the friendly owners downstairs, are very willing to offer information and share their experiences of living in the village and in Cyprus. The village is small but has a shop and taverna and is well situated for trips to the beach, archaeological sites and interesting villages. The motorway is only 2 kms away so the cities of Limassol and Larnaca are within easy reach. Car hire essential. Can recommend it highly.